If You Want To Be Younger, Healthier, Fitter, Slimmer and More Energised. Then This Letter Could Be The Most Important One You Ever Read. If you thought a daily massage was a luxury you could not afford you are probably unaware of the amazing new vibration exercise machines. Allow me to fill you in…..
Hello, I’m Steve Lockhart and I am sure you would already know who I am through this website and the work I am doing to provide useful information and answers to back pain sufferers all over the world. What I want to tell you about on this page is worth finding out about because it will have the power to change the way you feel every moment of every day and if you don’t feel at your best right now this will be especially interesting to you. And most importantly no more worrying about how you are going to find the time to fit some exercise into your busy schedule or some regular massage into your budget. 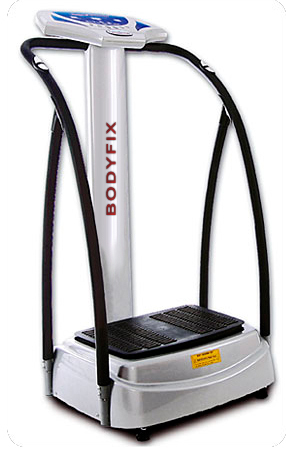 The vibration machine looks like a shortened running machine with a platform large enough to stand on comfortably. The action of the platform is very unique and it tilts from side to side at speed so that one side is up as the other side is down. The faster the speed you set the more vibration you feel along with the ‘rocking’ action. The effect on the body is to cause the muscles to switch on and off rapidly in a pumping contraction and release action. That is why it is so good at stimulating the circulation and initiating muscle activity. When muscles have been tight or dysfunctional for a period of time they become dry and rigid and the fibers stick together. They don’t get properly lubricated with blood and lymph when you move and are therefore starved of a healthy supply of oxygen and nutrients. The shaking and vibration caused by the machine helps to rehabilitate them from this state so they slowly return to a more supple, normal condition where they switch on and contract then release when exercised. Why I am so Passionate About Vibration Therapy ? You know for years I have been running thoughts through my mind, trying to figure out how you could make the ultimate machine for doing deep self massage on the body. I never came up with an answer but I now realise I don’t need to waste any more thought on it because someone else has already done it by creating the Vibration exercise machine. I have read that the technology goes back 30 years when Russian scientists wanted to develop a way cosmonauts could stimulate their muscles and improve their bone density after the deterioration caused by extended space travel. These more recent machines, that have come from this technology, are hugely popular in Europe and are now quickly becoming very popular throughout the rest of the world. As soon as I saw one and tried it out I bought it, instantly knowing its potential when I felt the way it worked on my body. Because it works to do all the things mentioned above and it is not a gimmick as many machines around these days are for one very important reason. It is the same reason my SLM Bodywork works so well at fixing pain when most therapies fail and I recognised that right from the start. It not only goes in deep and activates the core muscles, but it works on the full body not just one or two parts. I also have one of those massage chairs which I love but this machine is better for the reasons above. I also have a chi machine and foot massager but again this machine leaves then for dead for the same reasons. Anything that helps you work your muscles into a balanced position and does the whole body in the one session is a winner in my mind. That is why I am making it an integral part of my Self Treatment Program for Back Pain and Sciatica and why I highly recommend you have one. Ever since I produced my DVD and book I have been aware that it was not a total self treatment program for everyone because you still needed the gentle daily muscle work to maximize the results. This meant that people still had to get into the pool every day to do my water workout or search out and pay for a therapist to get regular massage. This was not only very expensive but it took a lot of time and effort and in the end it wasn't practical for most people. It was just another thing that added to the frustration and expense that back pain sufferers had already been putting up with for years. I knew there were not enough SLM therapists around the world to make a real difference, not yet at least, so getting treatment from someone who worked with a different philosophy and techniques would not provide the solution I had been hoping for. I have already found that to be true from the emails I have received from frustrated back pain and sciatica sufferers all around the world. Discovering the vibration machine couldn’t have been more timely. Sure it is not the ultimate solution to the problem, only skilled hands provide that, but it goes a long way nonetheless. The fact that it is a once of cost for ongoing treatment is one sure benefit. How Does It All Come Together ? Firstly diagnose the problem muscles that are holding the body out of balance. This is done with the self treatment guide and the SLM Yoga. Then target those muscles with specific exercises and self treatment techniques in the right sequence and frequency. These are also covered in the self treatment guide. Finally and probably most importantly, strengthen the body as you activate the muscles, stimulate the circulation and balance the whole system over a period of time determined by the overall condition and time the problem has been around. This is where the SLM Yoga and vibration machine combine to create a body that will cope with your chosen lifestyle and be easily maintained over a prolonged period. 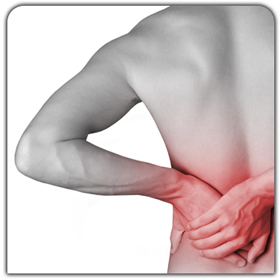 One of the big problems that sets up back pain is poor circulation. A critical structural muscle becomes injured or overworked and the circulation is restricted. In time the injured muscle becomes dysfunctional and other muscles start to compensate for it. This in turn overloads those compensating muscles and the problem can spread, causing the posture to change and the body to get out of balance. The pain that eventuates is nowhere near the original muscle problem and conventional treatments or testing find it very difficult to pin point where it all started from. This is one of the main reasons conventional treatments focusing on the painful area, fails to take back pain away. The advantage of exercise is that it improves the circulation, strengthens the body and initiates muscle activity. The only problem is that dysfunctional muscles don’t respond to exercise, rather they contribute to making the body move with the bad posture and irritate the already painful or weak area. The beauty of the self treatment program and vibration machine combination is that they work on the body without moving so there is minimal irritation. As you target the problem muscles and work to rebalance the body, by the time you get back to movement exercise the posture has changed and it is no longer a source of irritation. Not only does the vibration machine play an important supportive role in self treating back pain and sciatica it is a machine that can benefit the whole family, even if someone doesn’t have pain. For the sporty children it provides a great way to warm up before a game or other exercise and an even better way of warming down. This will have the effect of improving performance and minimising the chances of getting injured especially after coming back from a layoff which is when the large majority of injuries occur. For the person who works in a sedentary job where they are standing or sitting at a desk all day, it is the perfect exercise to come home to. Giving the muscles a 30 minute workout with a vibration machine at the end of a long day is a great way of winding down and relaxing a tired stiff body. When done every day, a real long term benefit of more energy and general wellbeing can be felt. After a day in the garden or on the golf course it is a way of ensuring you get a good warm up before you start and don't get left with days of lingering soreness afterwards requiring a trip to the physio or masseur to fix your back pain that has been irritated. It is the pressures that we put our body under everyday with our job and lifestyle that adds up and make us much more likely to end up with chronic back pain or similar. Better management such as can be done easily with the vibration machine takes care of that problem. It is commonly known that 80% of people will get back pain at some stage in their lives and so the odds of becoming a sufferer is really quite high for all of us. Many of those cases turn into repeated occurrences and the main reason for that can be put down to us not getting enough balanced exercise in our day to day lives. That is what got me so excited about the vibration machine, it is just so easy and convenient. I know most people are busy and find it near impossible to get the right amount of regular exercise they should. After all I am one of them and I see them in my clinic every day of the week. I am constantly seeing people with pain who know what they need to do but just don’t have the time and energy to do it consistently. With a family and full time job it is not surprising, so to me, being able to deal with that dilemma in such a simple way is a godsend and one I grabbed with both hands just as I recommend you do. The trouble with most things that are really good for us is that they are usually pretty expensive, but invariably you get what you pay for. It is like knowing we should eat organic food but it would cost us double what we normally spend. Some vibration machines cost as much as $10,000 for the home model and $20,000 for the commercial model you will see in some gyms. The price of the one I have varies from as much as $2500 all the way down to $900 or so. They all look very similar but the prices vary because of what is inside. I have checked out most of the models out there and settled on one that is priced very reasonably at $1250. I particularly like it because it has a quiet heavy duty motor and is supplied and serviced by a company that has been in business in this industry for as long as I have. They provide an 5 year warrantee on the motor, 24 months on parts and 12 months ‘at home’ service on labour and that leaves most of the competition for dead. What this means is if something goes wrong their service man comes to YOUR home and fixes it. That saves enormous hassles of packing it up and shipping it to the dealer should that happen. I did have a problem with mine when I moved it interstate but with one phone call, 2 days later it was working perfectly again. If you have a look at the COMPARISON CHART you can see how well this ‘Bodyfix’ machine stacks up against the competition. The only unfortunate things is it is only available in Australia so if you are in another country you will need to do your own due diligence and try to find as good a deal. If you like the idea of having a deep muscle workout in your own home available whenever YOU have the time. Especially if you have a problem with getting in the water every day, all year round, for that important part of the self treatment program, then think seriously about the Bodyfix Vibration machine. With Bryant Meyers & Special Guest Yosef Johnson as they discuss the concept, history and benefits of vibration therapy.